1. A year ago Beale AFB chapel was new - this week I'm the pied piper. We just added a few chairs to our row to accommodate. 2. Great sermon by my favorite Chaplain. 3. Relaxing afternoon with family - always a treat. Stacia chose the Asian Buffet....and I had a good laugh about the frog legs..... The van began making odd sounds on Saturday. Michael knew it was the brake pads and so we went out to find an auto parts store after lunch. Right next to the auto parts store was a thrift store. I think this would be perfect for Arielle - a Winco outfit...better than the Burqa I'm threatening her with. 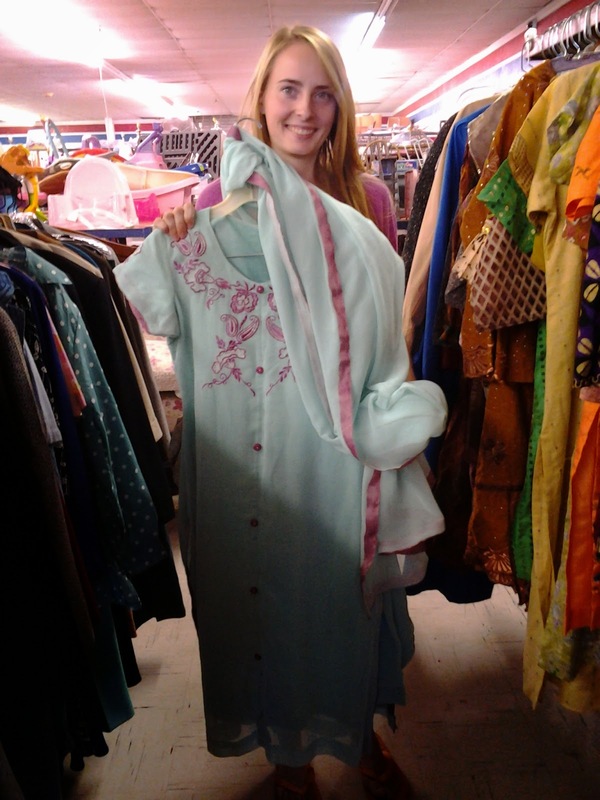 We were surprised how many really pretty Indian clothes were at the thrift store. You can't really see - but there are pantaloons included and a long scarf. Since we were "in the area" - I asked Michael about stopping at Cash and Carry. I wanted to buy some little "stoppers" or "pour-ers?" for my oil and vinegar....we found them. I got duck colors. 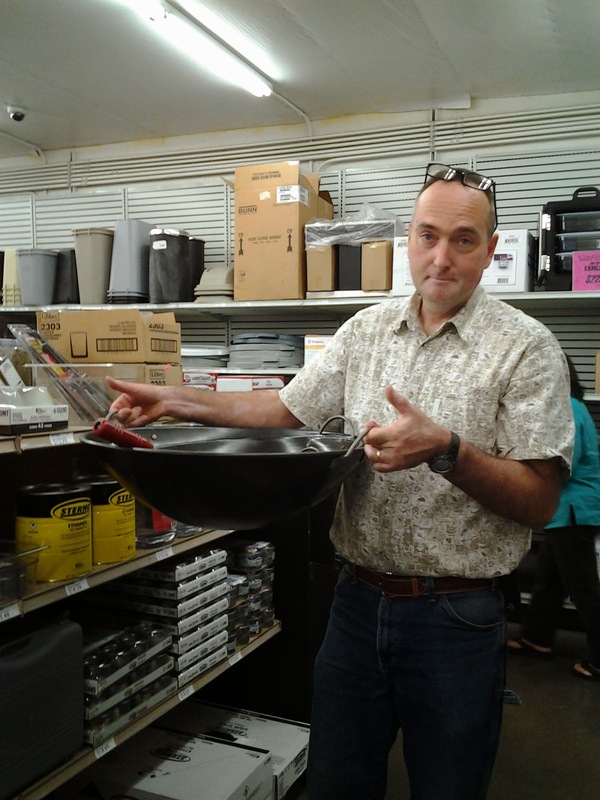 ::snort:: Michael thinks this may be big enough to take care of my messy yakisoba cooking. I was pleasantly surprised to find a few things we DO eat in there....a produce section where you can buy things in bulk - I'll explore it more next month- and lots of Asian products. I bought 2 1/2 lbs of panko crumbs - they had 25lb bags. No more puny bottles for me. Michael bought a BIG can of hard shell - I envision frozen bananas - I think others envision a tiny bit of ice cream swimming in hard shell. 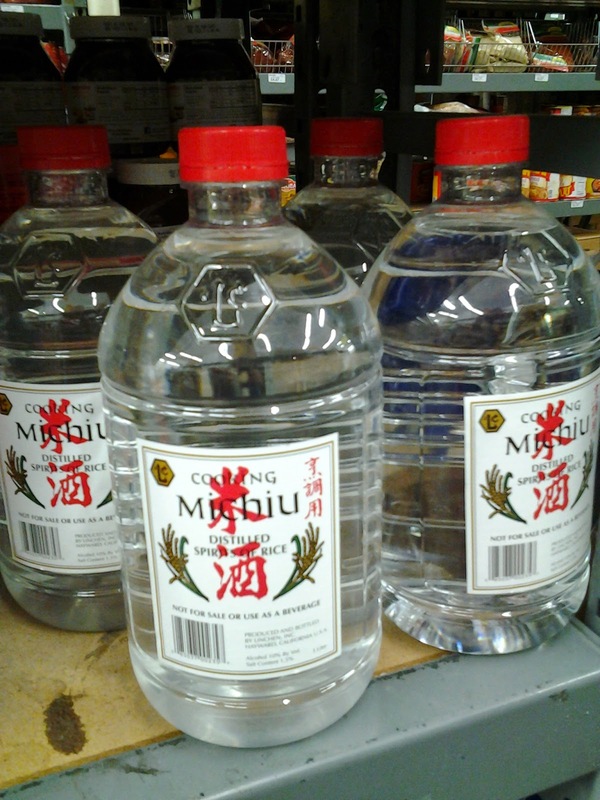 There were big bottles of yakisoba sauce and tonakatsu sauce....and I wondered if this "rice spirits" would be the same as Sake or Mirin in Gyudon? Stacia pointed out that our garden was PRODUCING....a carrot...which Yuuki wanted - badly. Zander helped me nail all the string in the boxes so he has part ownership in this greenery. LOOK at these. Just look at them. They are even more special as our NEIGHBORS brought them over to us. Imagine such wealth growing in your yard.